An incredible performance from Melbourne’s property market! Melbourne’s property market outperformed that of all other capital cities, for a third quarter in a row. Prices within real estate in Melbourne rose 3 per cent over the three months to June, according to the latest Australian Bureau of Statistics data, outpacing a national average of 1.9 per cent. Sydney’s property market was the second strongest over this period with growth at 2.3%. 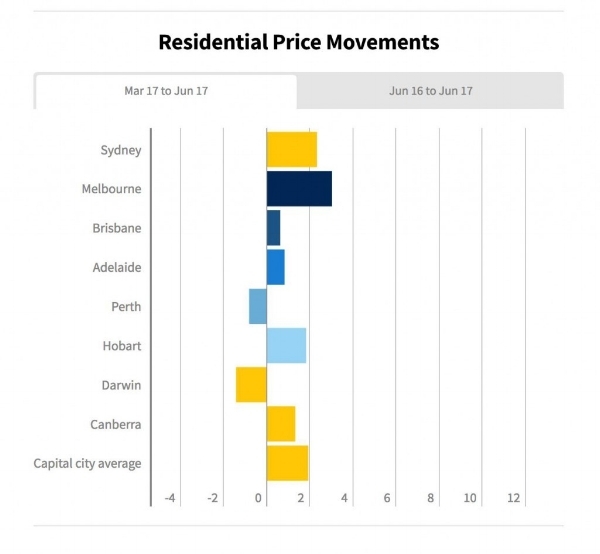 All major cities experienced growth during this period, apart from Perth and Darwin, where falls were recorded at 0.8 percent and 1.4 percent respectively. These figures reflect the June quarter, but it is worth noting, that the Melbourne market has held up quite well through a period where slight loss of momentum is expected. The market in Melbourne has maintained a steady level of growth more recently; this through the strong population growth in the city. It’s anticipated the market will continue to see change in the months to come, and it’s expected that the rate of growth will continue to slow throughout the remainder of 2017. For now, however, Melbourne maintains a strong seller’s market, and it will be interesting to see how the Spring auction season plays out across Melbourne and Sydney in the months to come. As mentioned in previous blogs, at Calla Property, we understand the significance of getting the location right when it comes to investing in property. Our research methodology, Calla Property Insights assists us in finding the best investment opportunities in the country. Considering factors such as economics and employment, supply and demand, population and demographics, and infrastructure spending, our macro research enables us to determine which geographical regions are forecasted to experience strong capital growth. https://www.callaproperty.com.au/wp-content/uploads/2018/10/a.jpg 382 500 Susan Farquhar http://www.callaproperty.com.au/wp-content/uploads/2018/09/static1.squarespace-300x155.jpg Susan Farquhar2017-09-25 06:27:592018-12-03 04:46:12An incredible performance from Melbourne’s property market!